Should The Supreme Court Proceedings Be Live Streamed? In case of Supreme Court, the right to transparency must end an inch before the right to speculate is created. The proponents of live streaming often advance various examples but chief among them is, other countries where the practice prevails, comparison of court with Parliament and the fact of latter allowing live streaming, and the need for educating the masses on how courts decide cases, and so forth. All these reasons combined together are too tempting for a neutral citizen to not favor live streaming. However, a deeper analysis of each of these reasons would entail that they cannot be blindly applied to decide the issue. The eminent judge from United States Supreme Court Justice Scalia was once asked as to why the proceedings in Supreme Court and other federal courts be not telecast live so that people can be educated about what goes into the courtroom proceedings? “Now…. I would be all for it…if they sat through a day of our proceedings gavel to gavel……. boy, would it teach them a lot. “They would learn that we are not most of the time looking up at the sky and saying, ‘‘Should there be a right to this or that? ’’ but that we are doing real law, the Bankruptcy Code, the Internal Revenue Code”. The proponents of live telecast of proceedings base their support mainly on two arguments, the need for legal literacy of the masses and the hallowed virtue of institutional transparency. Interestingly, in the Indian context, the idea of live telecast makes is dubitable for both purposes. A comparison of the Supreme Court with the Parliament is, at the most, illusory. The Parliament is fundamentally different from courts. Parliamentary debates are based on policy and policy by its very nature is experimental. The courts, on the other hand, function on logic and application of the law. As such a policy debate warrants the direct participation of public and wherever required, even criticism. The courts, on the other hand, are known not for the outcomes, but for the process. Secondly, assuming that the live coverage has a bearing on those who know they are being watched may influence their decision or at least behavior. Only an institution that represents the ‘will of the people’ must be exposed to such an influence. The Supreme Court does not, as it should not, represent the ‘will of the people’ and the consequences of the judiciary being subjected to such an influence are far too dangerous to be stated. There are many countries in the world that permit live streaming of court proceedings and there are others that do not. And yet there is only one country that is ours, where this question will be decided, not by the elected representatives, but by a constitutional court, on its judicial side, through a writ petition. That indeed is a lot of power. The average reader not trained in law should know that the court is not adopting a new rule of procedure for itself just as it did when it resolved to publish the minutes of the Collegium meetings. Instead, it will decide on whether more than one billion citizens have a fundamental right to watch the proceedings “in real time.” ? No other court, in any part of the world, has decided on such a question on its judicial side. Many courts have made observations on its importance and in some cases the difficulties, but that is different from deciding, judicially, whether live proceedings should be done. Such is the width of the jurisdiction of our Supreme Court that it decides on cases ranging from deciding on upholding the death penalty of a convict hours before the execution, till deciding on the river disputes between two states. The variety coupled with the sheer volume in which cases are decided makes our court incomparable. Compare this with the United States Supreme Court that hears on an average, only 80 cases in a year. Unlike the Supreme Court of India, US Supreme Court does not have such extensive jurisdiction. Even then the US has till now refrained from the idea of televising the court proceedings. The proponents also compare the Supreme Court with International Court of Justice to cite that the latter’s proceedings are available on a real-time basis. However, the principal difference that is often ignored between the two is that the International Court of Justice like most apex courts in the world, is based on written advocacy. The lawyers argue only through their briefs. Contrastingly, the Supreme Court owing to the volume of cases depends largely on oral advocacy. Therefore, a live coverage of ten minutes of exchange in court may serve more as a tool for speculation than for legal education. 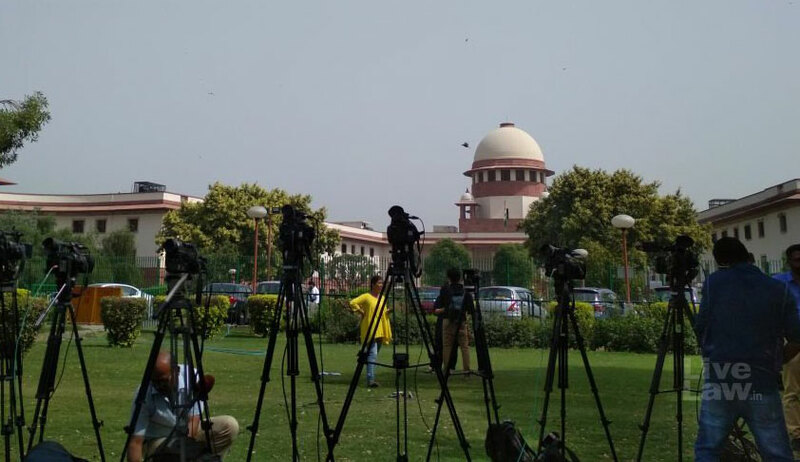 A proponent may still argue that the live coverage would apply only to cases of public importance and not where the privacy of a party should be protected. This argument is unsound on two counts. Firstly, the ambit of the term public importance is vaguely wide. Secondly, it ignores that a case of public importance not affecting the privacy of a party may still cause ramifications if broadcast live. Consider a case between two big Telecom Conglomerates. As some may argue, it would certainly be one of public importance. Nor will it, as others may argue, violate the privacy of an individual. And still its coverage would lead to huge ramifications. That the financial experts will sit with legal experts to predict the outcome of the case and that the stock market will monitor Supreme Court is obviously an exaggeration. But it should serve for our purpose as an example of the consequences that may follow. The most basic flaw in the argument supporting live coverage is that it confuses transparency with something totally uncharacteristic of it. In fact, out of ten reasons in favor of live coverage, there is not one for live. One wonders what purpose it would serve to telecast the proceedings live as would not be served by mere recording? But more than that, the real question is that what does transparency mean? Should the meaning of ‘transparency’ be confined to watching the proceedings in real time? In an institutional sense, the virtue of transparency begs more than mere observability. The Brazilian Supreme Court televises not just the court proceedings, but the conference of the judges while they actually deliberate on the case. But that fact in itself does not make it as the most transparent court in the world. When Justice Scalia gave his view against coverage, he was not speaking in a court, nor did he express his view to a journalist. He was deposing before the Judicial Senate Committee in response to a question asked by an elected representative. In other words, a Supreme Court Judge responding to a Senator. That is what transparency means. May there be a day when our Justices get a chance to be vocal about their views outside the courtroom. May there also be the day when citizenry becomes mature enough to differentiate between the personal and the judicial views of the judges. But till such time as that happens, the suggestion of live telecast of proceedings is an imprudent one.